After 3 seasons of surviving Clementine’s journey has come to an end. The Walking Dead: The Final Season ends Clementine’s journey with a bang. Providing new characters and extra problems to contend with. The narrative tends to take a few strange directions but constantly places the player in challenging situations. The Walking Dead: The Final Season provides a solid ending to this 6-year long series. 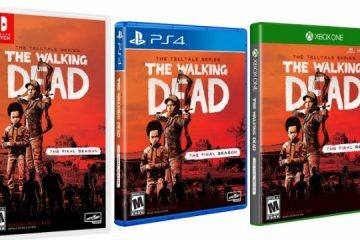 The Walking Dead: The Final Season starts similar to past seasons. With most of the actions of the previous adventure pushed into the background and a fresh start provided. Clementine is now a guardian and teacher to a young boy named Alvin Junior who was introduced back in season 2. 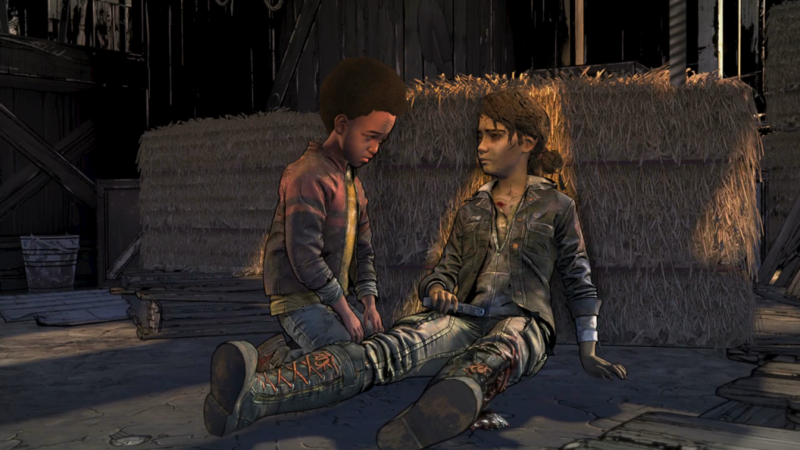 Now around the age she was in season 1 Alvin has no knowledge of the world before the Walkers and relies on Clementine for everything. Not only survival techniques but reading and morality. Alvin lacks experience with other people since they rarely meet people who aren’t trying to kill them. Because of this A.J. ask Clementine about many things like love, compassion, and specific things people do. 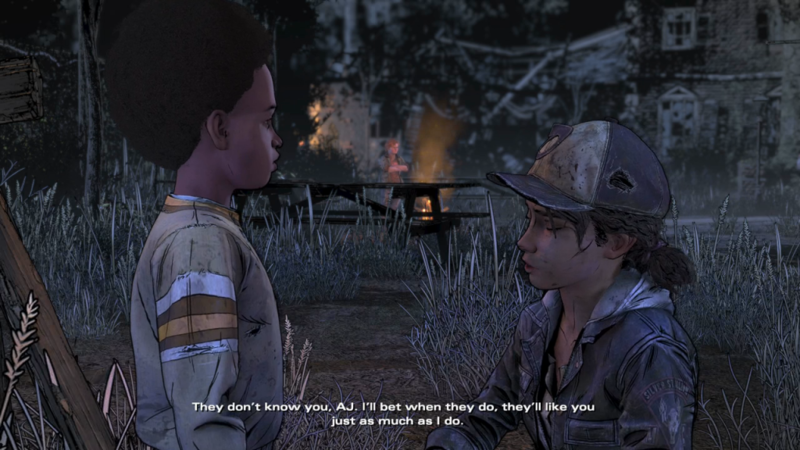 Similar to how Lee’s actions affected Clementine’s behavior Alvin will often justify his own actions based on what Clementine has done or said. Like past seasons Clementine eventually joins up with another group, this one consisting of children. The kids are housed in their old school for troubled youth. Most of the adults abandoned the facility following the outbreak, forcing the kids to take charge and build their own society. As first, it seems like an ideal place for a home. In past seasons the adults tended to overlook Clementine because of her age but here things are different. The kids established a system of leadership and rules but it’s clear they have no idea what they’re doing. Most of them are just trying to stay alive to the best of their ability. Clementine has a bigger voice considering her experience overshadows many of the others. The kids themselves are wonderfully voiced and sport unique personalities. Ruby has anger issues, Violet is shy but brash, and Louis is energetic. Some are given more time in the spotlight than others but each is distinct enough that they don’t completely bleed into the background. But like in true The Walking Dead fashion dark secrets are hidden between the cracks and eventually they are revealed. Leading up to the upcoming conflicts of the season. The sheer amount of difficult decisions Clementine will have to make is staggering. It matches the quality of past seasons and leads up to an impressive finale. The problem with the finale is the pacing and it seems rushed. This could be due to the closure of Telltale Games but Clementine’s finale is a satisfying one. Considering that the writing team has to adhere to certain aspects such as the continuation of The Walking Dead series a solid conclusion should not be expected. The core of Telltale’sThe Walking Dead has always been choices. 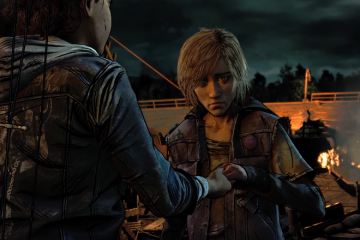 Clementine will still need to make minor and major choices that shift the story. Some alter the relationship with specific characters and others can lead to death. Fortunately, the developers included a helpful timeline to highlight what critical decisions were available and how each character felt by the end of each episode. This level of variety encourages replayability. Players will need to replay episodes if they wish to see all the alternative decisions. The issue with this being that players cannot skip dialogue and must replay the entire episode. Since each episode is about 2-3 hours long expect long threads through tedious things just to change 1 choice. Outside from the choices Clementine will have to engage in combat. 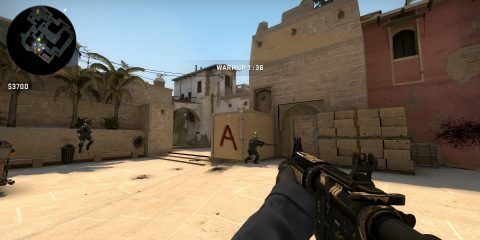 Some are simple line-up the reticle to a specific area. Other times Clementine will need to engage in third-person shooting and melee combat. The melee combat is pretty easy, having Clementine disable and kill Walkers. The shooting is a bit harder since it lacks the precision and feedback from other acclaimed third-person shooters. You’ll use a bow and arrow for these sections and the shooting seems floaty. 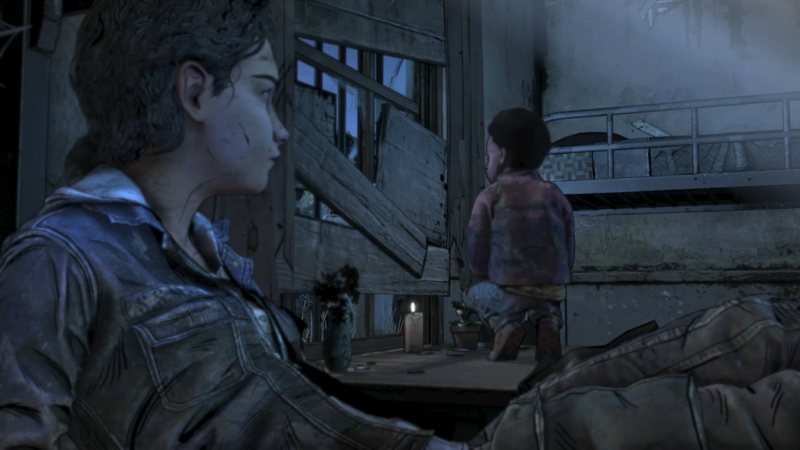 After surviving Walkers, enduring the betrayal of her friends, and mother a child at such a young age Clementine has had a long and draining journey. The narrative takes some questionable changes and danger seems to sprout out of nowhere but by the end it’s all worth it. The Walking Dead: The Final Season won’t satisfy everyone but it gives Clementine the finale she deserved.